TPU published details about Gigabyte's Aivia M8600, an upcoming ambidextrous wireless gaming mouse. The peripheral features nine buttons arranged with perfect symmetry and has a 5600 dpi dual-laser sensor that promises 6500 dpi like performance thanks to Gigabyte Ghost technology. The sensor tracks movements at speeds of up to 150 inches per second, and the mouse has 32KB of onboard memory to store macro profiles. 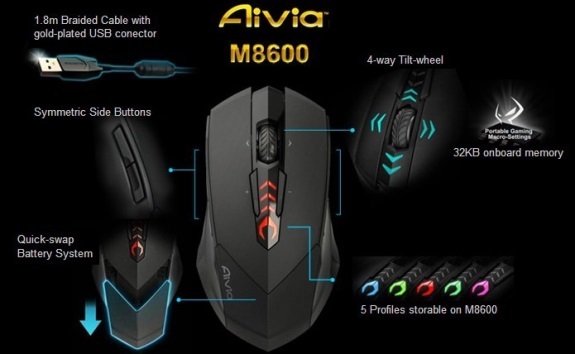 The Aivia M8600 can be used both as a wired or wireless mouse, it features a 39g lithium-ion battery that promises up to 50 hours of continuous gameplay on a single charge, and it comes with a second battery so you can "refuel" should your battery run out in the middle of a gaming session.